I must say that I love the creaminess of a good, fattening chicken divan. I know that it is loaded with calories from the cream of chicken soup, mayonnaise, and butter. Perhaps those ingredients are what makes the dish so tasty. Yes, I'm sure it is in part, but there's more to it. I do love the broccoli, too, though, which is part of the pull for me. Chicken divan (or turkey divan, a dish I've actually come across more often--is an excellent way to use broccoli in cooked dishes. Since the first time I tasted turkey divan, it became one of my favorite dishes. Having more frequent access to chicken, that's what I use when I make the casserole at home. Recently, I decided to try a reduced calorie version of the creamy, fattening chicken divan, and the result was a very tasty dish. I was pleased. A divan is an older term for a couch or sofa. So why is it used in a recipe? Well, the French use of divan gave the connotation of a grand ole meeting place, it seems. A New York restaurant noticed that and adopted the "divan" as part of its chicken recipe to give off a sense of elegance. I'll agree that turkey divan does sound much more elegant than turkey sofa, don't you? Turkey divan is the name of the dish I discovered and enjoyed where I used to work. Using the original meaning of divan, my friend would laughingly call the dish "turkey couch." 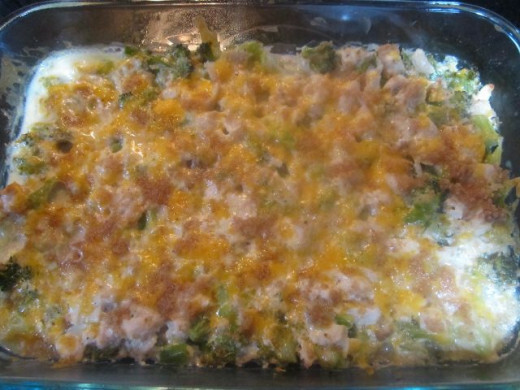 Rate this Light Chicken Divan Recipe! 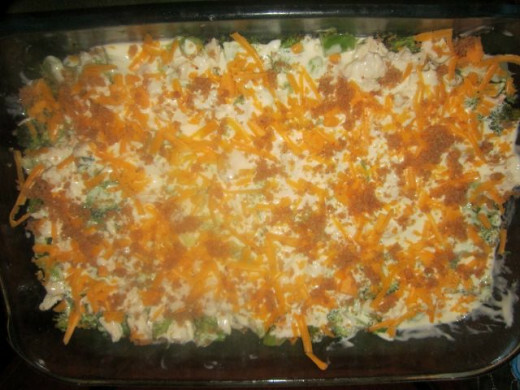 Broccoli Chicken Divan before going into the oven! 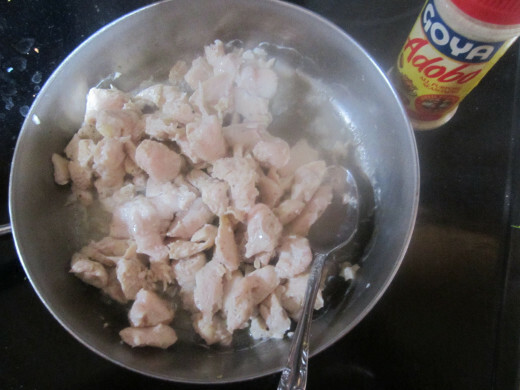 Cook chopped chicken on stove until browned. 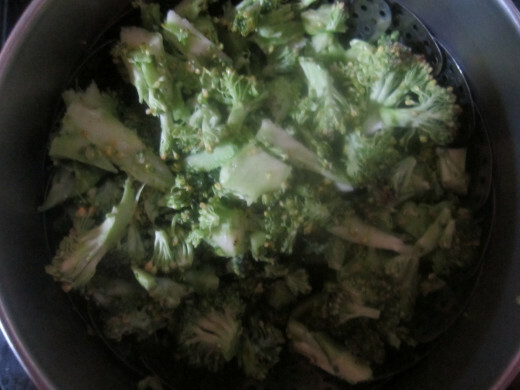 Meanwhile, chop up 4 cups of broccoli and steam in double boiler on stove or in microwave. Mix together in a bowl the soup, milk, mayonnaise, lemon juice, and shredded cheese. Sprinkle in salt, pepper, and garlic salt to taste. 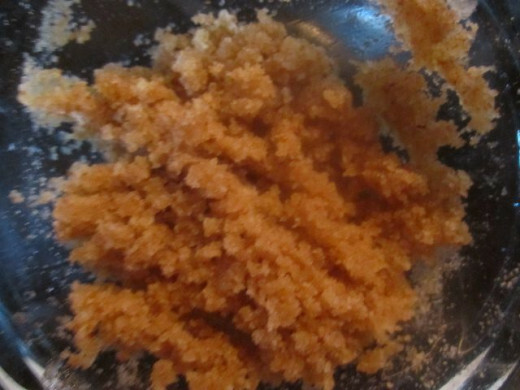 Melt the butter and mix in the bread crumbs. 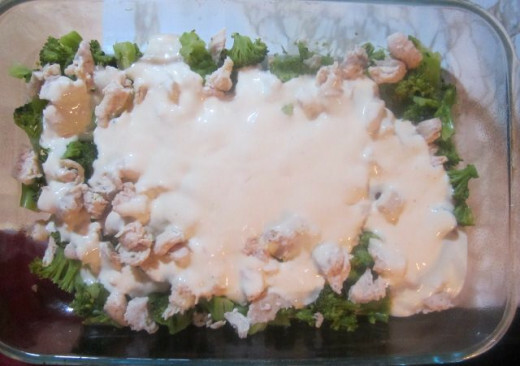 Layer 9 x 13 casserole dish or pie dish with broccoli and then chicken. Spread the liquid mixture on top. Sprinkle bread crumb mixture on top. Place casserole in preheated 350 degree oven until cheese is melted--about 20 minutes. This dish goes well served with rice. 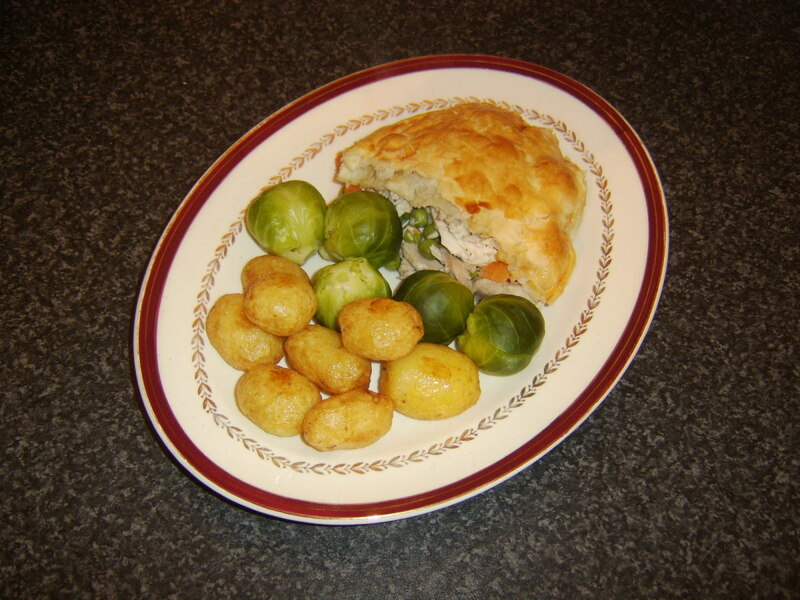 How Did the Light Chicken Divan Turn Out? This light chicken divan recipe came out very well. It was a hit with my boyfriend, as we enjoyed it with rice. It didn't have as much of the creamy goo that I have loved with previous divans, but it made up for that in flavor. I probably used about half of the soup and mayonnaise that typical chicken divan recipes call for. I might opt to use more of the creamy stuff the next time I make this recipe in order to compare results. I estimated my servings to be larger than some might. Smaller servings would bring down the calorie count per serving even more. I give this chicken divan experiment a big thumbs up! You're welcome, vespawoolf. Glad you liked the history of "divan." Hope you love the dish! My mother used to make this dish when I was little. Now I look forward to this lighter version! The meaning on "divan" is interesting and the history behind the dish. Thank you! random, I thought it was excellent. Perhaps the more caloric version has more creamy goo, but that brings more calories, too! This lighter version still looks really tasty! I don't think you'd miss the added calories at all. Thanks, teaches! I thought it worked out well. Very tasty, and a good way to cook broccoli! 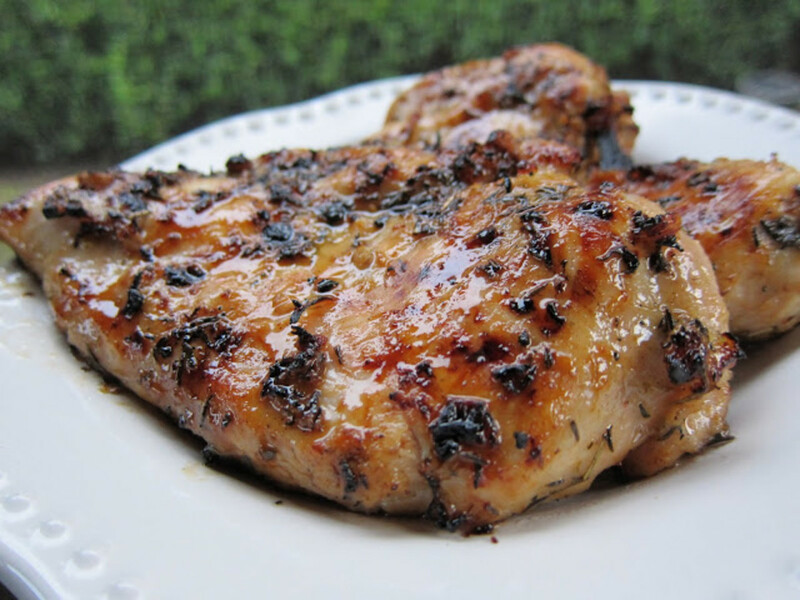 I have never had this recipe but I do like the ingredients, especially love chicken suggestions. It does have a lot of healthy benefits. Looks really good -- divine! Vee....I love your hubs, I love your recipes....I even love you.....BUT I'M NOT COOKING AND I'M NOT DRINKING EGGNOG. But I did come to visit!!! lmao!! eatforcheaper--Glad to hear it! I really like it! Try it, Joyce! Lots of vitamin C here! Glad you like the hub, fjohn. Hope you do try it! I enjoy a good chicken and broccoli bake! Sounds so delicious I'm going to print it and give it a try. We take a 1000m vitamin C supplement and your body dumps any extra C.
hi victoria ... nice hub.. definitely i will try this . Try it, Lady E! You will love it! Only because it is you, Vicki, only because it is you! Victoria, this is so lovely and healthy. I only boil broccoli and it would be nice to prepare it another way. I love it.